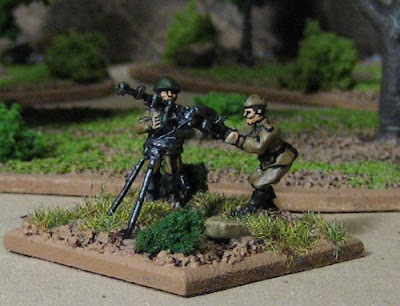 So, of the ten, or so, forces I have “on the go” I’d have to say that the Late War German SS and the British/Canadian Paras would be top priority (not that anything in the 20mm WW2 category is really a BIG priority or anything right now… I got Other Things to be doing)! This is due to the fact that they have the least stuff that needs to be done for them to be fielded on the tabletop. 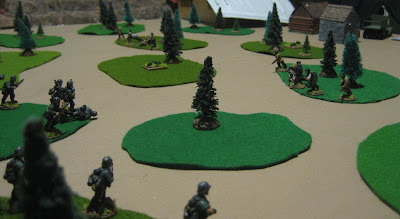 Since posting this originally I have finished up a few of the things I had to do – the CO, and mortar and Pioneer stands. You can see those in a recent Painting Update. *Paint anything else on the TO GET list as it is got! Paint a fourth battalion? I have them prepped and based… they could be an Airlanding (Glider) Regiment…? **Paint two infantry stands to finish off third battalion!! **Paint one (or two) Pioneer stands to finish off Pioneers!! *Paint any of the stuff to get above! Build and paint plastic kits by the dozen! -Another box (or two) of Italeri Russian Infantry – includes 3 HMG to finish off Divisional MG Company. The Naval Infantry, when I get some, should be first. The cavalry next might be fun! 3x Jeep+trailer+driver (Jeep+trailer – Rafm, Drivers? 2x Carriers for Divisional Recce Sqn!? Last, but not least, the Americans. I got almost all of these in trade. To be honest I would never have considered building an American force. It’s not that I don’t like Americans, or think their contribution to the war effort wasn’t significant… It’s just not a force that ever really interested me. 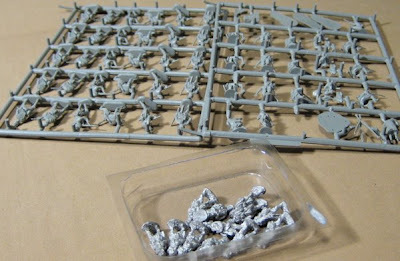 But now I got a pile so I might as well organize them into something I could potentially use for Blitzkreig Commander. US paratroopers. 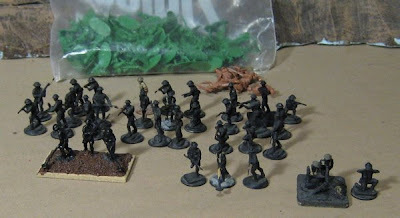 The flanking battalions are ESCI, the one in the middle is Airfix. I have all the Paratroop infantry I need. 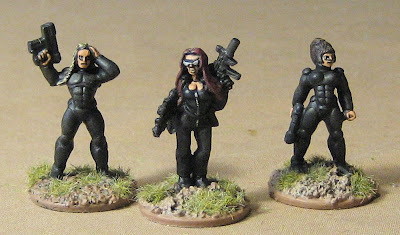 I just need a couple more MGs, some mortars, an HQ and some observers and this force is complete (well, except for that whole PAINTING thing…). This is a mix of Esci and Revell US Infantry. From left to right: 4 MG stands, 3 Mortar stands, nearly two infantry battalions, 3 engineer stands. One more box of the Revell and I’d be right kitted out except for the guns and trucks! -FAC - NEED TO GET! RHQ/CO - HAVE: NEED TO GET! -1-2x 105 Howitzers + trucks? - NEED TO GET! -1/3x AT platoon (57mm) stand - HAVE: NEED TO GET! 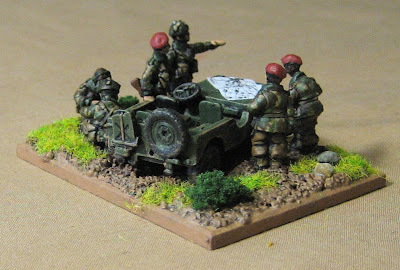 FAO - HAVE: X Painted, X To Paint, NEED TO GET: 1 or 2..
-1x Jeep Recce Stand - NEED TO GET! I know what you’re thinking… “How could he POSSIBLY have any more 20mm WW2 armies…! ?” I know that’s what I’M thinking! They certainly will be versatile. These lads will, if they ever get painted, get to fight my Early War Germans, The Fallshirmjagers, the Italians, and the Late War SS. I even thought I’d do a scenario where fighting breaks out between the Canadian Paras and 3rd Russian Tank Corps when they refused to stop for he Canadian’s Roadblock at Wismar! HUZZAH! Russian Cavalry! There are some Combat Miniatures here, some plastic horses from Empire Games, some WW1 Russian Cavalry of unknown origin, and even three horses and two riders from Grenadiers old Twilight: 2000 line! Soviet Naval Infantry. Almost a battalion of them! These are from Figures, Armour, Artillery USA. Russian AAMG… I don’t actually see stats for any Russian AA in the BKC book… or even anywhere that it shows up in any Russian OOB/TO&E… Hmmmmm pretty model… Not sure what to do with it. The plastic stuff. From left to right: an HQ, Almost a battalion of infantry (8 stands), 3 HMG stands and two mortar, a CO, another Infantry battalion, and an HQ for the second battalion. These are all from ESCI or Italeri. The CO is kind of ugly – I’d like to replace it with something… well.. nicer at some point. The Infantry battalion on the right are all in winter uniform – many of them are even on skis which limits their usefulness…. So another battalion might be handy if I ever wanted to field an entire regiment in the summer…. I’m not sure of the make of the T-72. I got it at this large antique mall/flea market type thing and then gave it to a friend who was interested in doing Russians – he gave it back to me a couple years later after he abandoned 20mm…. the two IS-2 are from the new Italeri Fast-assembly line-up. I don’t really care to have big late war tanks, but, like the Jagdpanther it was the only thing available at the time and I wanted to check them out. I could always use them with post war Chinese (If I ever did an army of those) or with my “AK-47 Republic” African forces. RHQ/CO - HAVE: 1 To Paint, NEED TO GET: ? Lots of guns, all off table! -1-9?x T-34 - HAVE: X Painted, 1 To Repaint, NEED TO GET: 2-8? -HQ - HAVE: 1 Painted – DONE! -1x HMG - HAVE: 1 Painted – DONE! I have a smattering of French Armour – none of which would belong in nits with each other – as far as I can tell. I don’t really want to buy a pile more to make an armoured regiment or anything… I have no infantry to speak of and no one, as yet, is making any cheap plastic French WW2 figures… I guess I could do what John did with his 15mm French – Buy some late war WW1 French and just call them “WW2 French” – the only problem is that nit-pickers would point out that the rifles were quite different – the one being used in WW1 was considerably longer, I think. Not that I game with any nit-pickers. Of course I do need someone for my Alpini and Early War Germans to fight… maybe when I get around to doing THEM I’ll worry about acquiring come more French. There isn’t one really. Just dreams of what I might do when I’m retired. Actually THIS is a good reason why I’m doing this – the French – had I a clear and concise plan when I purchased those French tanks, well, I might not have purchased them! Maybe the FT-17s will see use with my 28mm Back of Beyond stuff (yes, I know it’s a touch on the small side… whatever..) I could use the Somua as captured tanks employed by the Germans – I seem to recall 21 Panzer Division was initially equipped with Somua tanks when it was reconstituted in France after the downfall in North Africa… maybe they still had a few kicking around in June of ’44…? -3x M13/40 - HAVE: 1 To Paint, NEED TO GET: 2? All the Platoon 20 metal guys are just regular Italian Infantry. They don’t have the little feather thingy on the side of their helmet… I’m not sure I want to model one on each helmet that’s missing one… I guess I could use them later in a regular infantry regiment or just have alpini without their feather do-dad. MORE Canadians! These are, likewise, is far from ready to be fielded. This force is organized as a Canadian Infantry Brigade of the 1st Canadian Infantry Division in Sicily 1943 for Blitzkreig Commander. -1x 4.2” Mortar Bty - NEED TO GET? EXTREMELY low on the priority of “things to do”…. It’s a “someday” brigade. As for organization I’ve have two options there is the Regimental OOB listed at Bayonet Strength list shows three parachute infantry battalions per regiment while the OOB in the for Blitzkreig Commander book (with which this force is to be used) shows a Regiment as having two battalions of Parachute infantry and one Parachute Assault (Pioneer) battalion…. The OOB at Bayonet Strength is for 1944 and the one in the BKC book is for 1940-41, so the latter would be more useful. The 1944 list on Bayonet Strength is probably for after the Luftwaffe was more or less gone and the Fallshirmjagers were reorganized as “elite” ground infantry…. The problem is I don’t have anything that really looks like fallshirmjager “pioneers”… I do have three battalions worth of regular Fallshirmjager infantry ready to be painted, however. So I’ll probably start with painting up what I’ve got and pick up some pioneers at a later date. Wait, not all plastic. In the lead battalion the HQ and the Mortar platoon stands are from Dixon and the two MG platoon stands are from Platoon 20. The rest are a mix of Revell and ESCI plastics, there might even be an Airfix fallshirmjager in there somewhere..
1x CO - HAVE: 1 To Paint, NEED TO GET: a better one...? - 3x 10.5 cm Howitzers - NEED TO GET? -1-3 12cm Heavy Mortar batteries? - NEED TO GET? 3x Pioneers platoons - NEED TO GET? I’d totally have to make a few gliders from scrap wood! Son of More Taking Stock – The Sequel!! This force is organized for Blitzkreig Commander. So… Yeah… This is it for painted stuff… Like I said – “VERY FEW”! From left to right: SHQ bicycle team, two Dixon Mortar teams, Assorted Revell officers. The Panzer I I got from RLBPS… I think it’s a Frontline model… but I cant’ recall for certain… The figures are Revell Pioneers. Revell plastic infantry, and some Falcon 20mm infantry marching. I have some more Revell pioneers in a box somewhere, too. 1x 15 cm group - NEED TO GET? -1/3x BnHQ – Command Stand (1/3 total) – HAVE: 1 Painted (to be re-based), ? To Paint, NEED TO GET: a few? FAOs - HAVE: 2 To Paint, NEED TO GET… more? I’d like to add some more – but this is all a LONG way off! Maybe some of the Hät PzkwIII… some more Pzkw I and some Pzkw II from… somewhere.. Still more stocktaking… I plan to finish up the 20mm stuff today! Next up are my 20mm World War Two German SS Panzer Grenadiers… These will be fielded as elements of the 12th SS Panzer-Grenadier Division (“Hitler Jugend”) to oppose my Canaidan Infantry in Normandy or as elements of the II SS Panzer Corps to oppose my British Paras in Arnhem. Three Battalions of SS Infantry. From left to right; 1st Battalion - the infantry and HQ are Platoon 20, The mortar is SHQ, and the MGs are Revell (I think), 2nd Battalion - the infantry and HQ are Revell and Italeri/Esci, the mortar is Hät, 3rd Battalion - the infantry and HQ are a mix of Dixon, Combat Miniatures, Platoon 20, and Revell and Italeri/Esci, the mortar and one MG are Hät, the other (painted) MG is SHQ. The Regimental Pioneers – all Platoon 20. Two Jadgpanthers. Why, oh why do I even have these? I wanted to check out the Hät/Armourfast kits when they first came out (or at least when I first became aware of their existence) and this was the only one available – I LOVE these kits – so fast and easy to assemble and paint – Italieri has followed their example (I picked up a pair of their IS-2 tanks – likewise a dream to assemble!) and I hope others do too…! Recce; The Sdkfz 222 (on the right) is from Britannia and the Panzer IIL “Lynx” (on the left) is from Rafm. 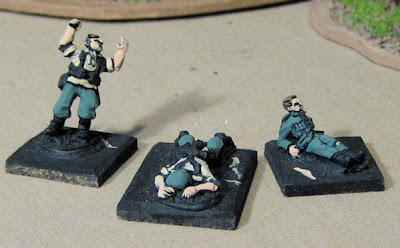 A couple injured from Combat Miniatures – this is something I keep forgetting to put into the plan – injured figures for suppression markers… Need to get some more! -1x Pak40 (75mmATG) - HAVE: 1 Painted – DONE! -1x Pak38 (50mmATG) - HAVE: 1 Painted – DONE! but that’s not 150mm… StuH42…? But that’s 10.5cm… I’ll probably just use the Stug here. -1/3x BnHQ – Command Stand (1/3 total) – HAVE: 3+ Painted – DONE! 1x Sdkfz 222 – DONE! 1x Pzkw IIL – DONE! 1x Medium Battery (15.0cm) – Always off table, therefore don’t need! Getting back to Stock Taking... I now present to you my 20mm WW2 Canadian Infantry. This is far from ready to be fielded – but I have a lot of what I will need – there are just a few things I’d need to pick up to finish this lot (but a LOT to paint yet)! This force is organized as a Canadian Infantry Brigade of a Canadian Infantry Division in Northwest Europe 1944-45 for Blitzkreig Commander. The Infantry and HQ stands of the three infantry Battalions. The Battalion in the foreground is a mix of Platoon 20 and ESCI/Italeri and the HQ is Britannia. The battalion in the top right is made up of Revell plastics, with Platoon 20 HQ. The Battalion in the top left is all ESCI/Italeri plastics. At some point it might be nice to pick up a few more Platoon 20 to finish up an entire battalion’s worth of them. Brigade HQ (CO) HAVE: 1 Painted. DONE! -1x 3” Mortar Platoon + carrier (3each total) – HAVE: 3 to be Painted NEED TO GET: 3 Carriers? -Armoured Recce 2x Stuart – DONE! - Air Support – Typhoons? These are low in priority at the moment as I am, in theory, concentrating on my 28mm Seven Years War stuff for the 2009 Wargames Weekend. Of the things I need to get I think I think the pioneers, the final 6-Pounder and some carriers would be the priority, but really I should just get painting what I’ve got! Back to taking stock – here’s a quickie for tonight – ZOMBIES! I wanted to do these on their own as they are a cross-genre sort of thing. I’ve used these with Fantasy Medivals, Swashbucklers, Victorian Horror, Pulp Adventre, Weird War Two, Vietnam (Tour of Darkness), and Moderns… You name it, any era, you can always add zombies! 20 Painted Zombies. 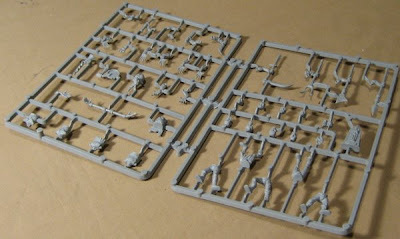 There are Games Workshop, West Wind Productions, Coppelstone Castings, and Reaper Miniatures zombies in this lot. A lot of them are sort of tan/khaki as the big motivator to get a bunch done, initially, was a scenario I was planning on setting in North Africa during World War Two; X Patrol of the LRDG was tasked to reconnoiter and raid a Secret German base deep in the desert…. Guess What they found there?! Conveniently the khaki also worked for zombified North Vietnamese in Tour of Darkness. 20 MORE zombies that have just been based. 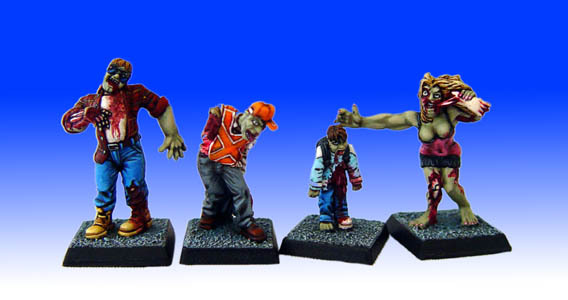 These are Modern Zombies from Mega Miniatures. As promised here a few more 28mm WW2 types and some other stuff. 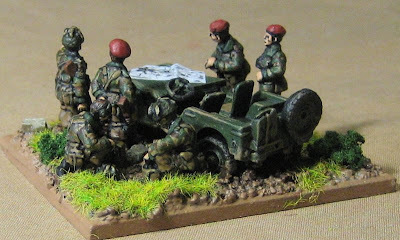 With this batch I have finished the last of the British Desert Commandos…. I don’t think I’ll be adding anymore anytime soon. 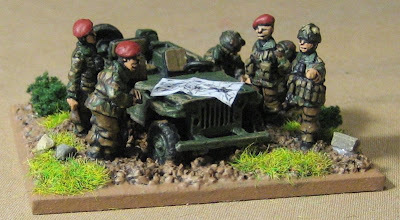 Brigade Games has some nice looking SAS jeeps in 28mm, as do a couple others along with some LRDG trucks (S&S, Chieftain Models). Brigade’s ”Desert Commando Jeep Patrol” looks awful tempting… (Been thinking about picking up the Rat Patrol Boxed set). Amanda and the kids are off to Windsor for the next week and a half so this weekend I thought I might try to get a bunch of the Stock Taking finished up before I get cracking on all my assigned house fixin’ duties! I got busy doing some Paras this week (and some other stuff…). This will be my Brigade HQ for the Blitzkreig Commander 20mm British Paras. The figures are from Figures, Armour, Artillery USA. Nice figures. I really like them. I’d like to get more, unfortunately they totally ballsed up my order and shipped it to some guy in Germany and sent me his order… they did get most of the stuff I ordered to me in a reasonable amount of time. But there’s still eight packs they haven’t sent me and they haven’t returned any emails since the New Year… so… Too bad, I like their figures. The Jeep is from Rafm. More pretty FAA toys. A Pioneer platoon, an HQ and a Mortar Platoon. 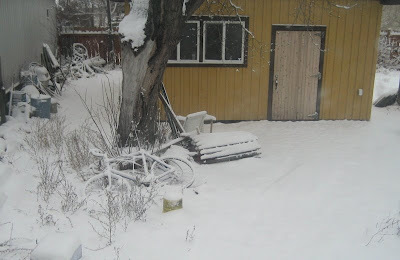 The HQ will be for Frost’s 2nd Battalion (that’s Johnny Frost himself, there, blowing on his copper fox-hunting horn). Why do anything in one scale when you can do it in TWO!? 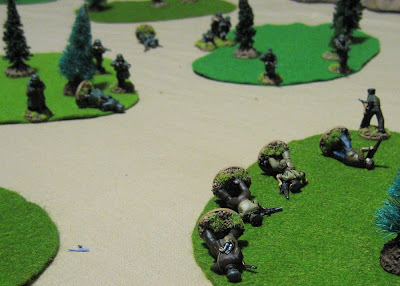 I also painted up some 28mm paras for Savage Worlds Skirmishing. These are a mix of Foundry, Crusader and West Wind Productions. I also finished up a couple of modern/sci-fi types – The one in the middle is from The Foundry the other two are I-Kore Void figures. They were quick. They were easy. They are done. There will be a flurry of blog posting over the weekend (and following week) including Thursday’s AAR and a pile of stock taking and painting updates as the rest of the family is off on vacation (I get to “work on the house”). 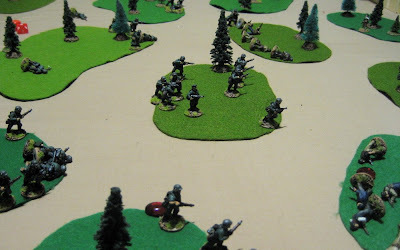 I had so much fun last week using Savage Worlds for some Second World War skirmish action, I thought I’d do it again! 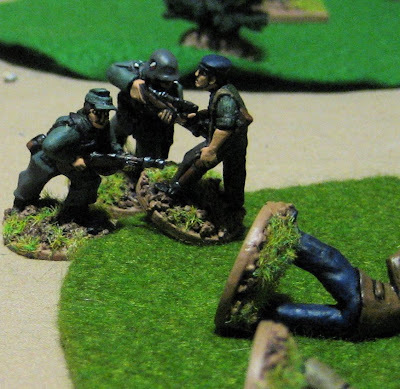 I also happen to finish up some Germans (that was brought on by the excitement over having traded away my 15mm Fallshirmjagers for some 28mm WW2 Russians (not that they’re going to be here this week or anything…they’re coming from the Netherlands!?) …you know how it is though, right? Tired of the incessant raids by resistance groups a local commander has decided to step up efforts to extinguish this threat through constant patrolling and sweeps through the nearby wooded regions. On this particular morning the Germans are about to stumble on a resistance group’s regional HQ/Safe House. There is a lot of valuable equipment there, which can’t fall into the Germans hands! Luckily pickets have warned the HQ of the approaching Germans and steps are being taken to spirit away the weapons, ammo, communications equipment, codes books and whatnot but the Germans will need to be stalled! Two cells of Resistance fighters that were close at hand have been sent out into the wood to try and stall the German’s advance! The French must delay the Germans long enough for the truck to get loaded with all the weapons and equipment. 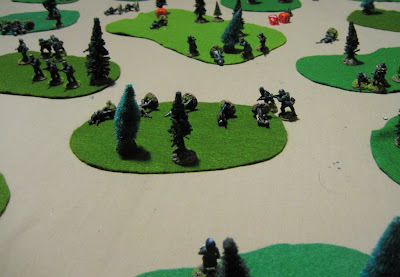 There will be no figures representing those loading or driving the truck – at the end of the 6th turn (and each turn thereafter) the French player will roll a d12, if the sum of the roll and the turn number totals 18 or more they have loaded the truck and driven off – the game ends the remaining French resistance will fade into the woods and disappear! The Germans will set up within 12” of the eastern edge of the table, the French HQ and truck are on the western edge of the table. The truck may be fired on and if disabled the Germans win. The Germans may also win if they physically get to the truck before the end of the game. Gary and Christian showed up to play this week and they decided they’d play the Germans and I could play the French. I deployed rather hastily and probably should have set up a little differently… ah well.. I also should have given the first team to fire “the drop” (+4 to hit, +4 to damage) assuming they hadn’t been spotted… might have evened out the odds a bit. 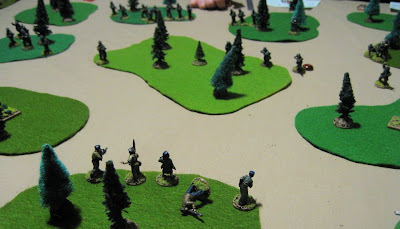 The Germans begin their advance through the woods. 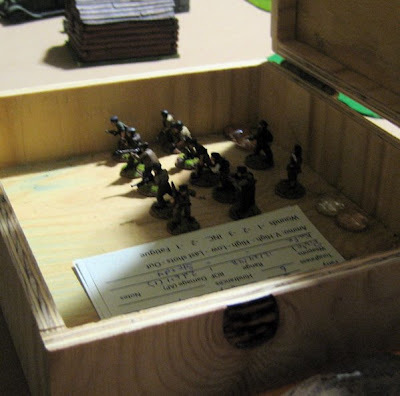 Here are the French forces – not only was the location of these forces unknown to the Germans, the SIZE of the French force was also unknown and hidden in this box until I decided to deploy them. The Germans advancing. You can see some of my brand new hidden unit markers sitting in the wooded areas in the foreground (the empty, square 30x30mm bases). 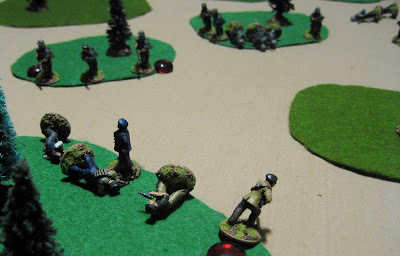 On turn three I revealed one units and K.O.ed two Germans in the ambush, but some swift action of one of the German LMG teams (and some pretty damn lucky dice rolling) saw one of my Frenchies to buy it as well! On turn four I revealed the second unit and K.O.ed two more Germans. But I also lost a couple to the sheer volume of fire coming from the Germans. Marcus Andres shot and killed an LMG gunner. The firefight carried on for the next four turns. The Germans slowly whittled away my forces. 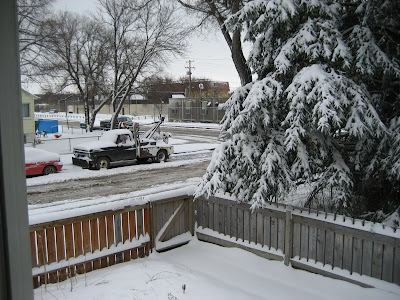 In the background of this shot you can see the Resistance HQ and the truck being loaded. Andres did shoot the MLG teams loader as he tried to take over the gun, and then shot the Ammo bearer as he tried to take it over. There was some grenade tossing back and forth between these guys above. 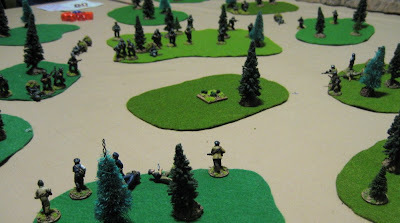 I believe that’s what caused the two Germans to be shaken..
Christian – who had never played Savage Worlds before – wanted to see how close combat worked and so charged in a pair of guys to attack the remaining Resistance fighter – one of them hit and caused 25 damage! (5 wounds, if one were counting!?) "Urk! Je suis mort!" Germans swarming forward, Fifi making a run for it. Truly this day was a disaster for the Resistance! I really should get back on track with the stock taking and then get back on with the The Game Plan! Honestly, though, there’ll be a few more painting updates first as I’ve been painting British Paratroopers (in 20mm AND 28mm!?) the last couple nights….